I've been using these products for a month already, and I think it's time for me to share with you what I think about Neesya skincare products. As usual, I always make sure I ask them if the skincare going to irritate my super sensitive and acne prone skin type. To me, there's no guarantee when it stated suitable for all skin types. Thankfully, they asked me to do a patch test on the side of my cheeks/neck or the inside of my arm area before start using it. Of course, if there is any itch or redness on the skin, you have to immediately flush away with lots of water and do not use the products anymore. I also was informed that the essence will help to stabilise oil production with regular use and it then should reduce oil production too. A thorough cleansing is required especially when you have a very sensitive skin like mine, because a little bit of dirt will break your skin out too. I would say this is a really great Eye & Lip Makeup Remover as it instantly remove all the makeup including waterproof eyeliner and mascara. 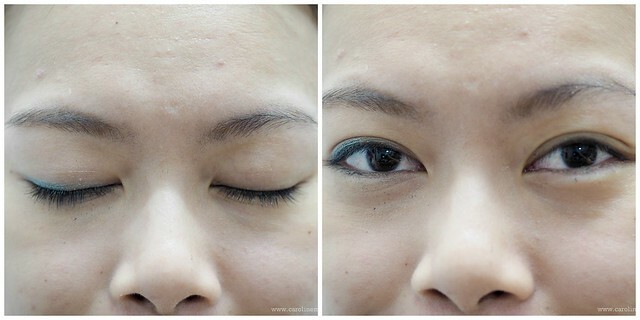 There's no rubbing needed which also means it won't cause any fine lines around your eyes area. 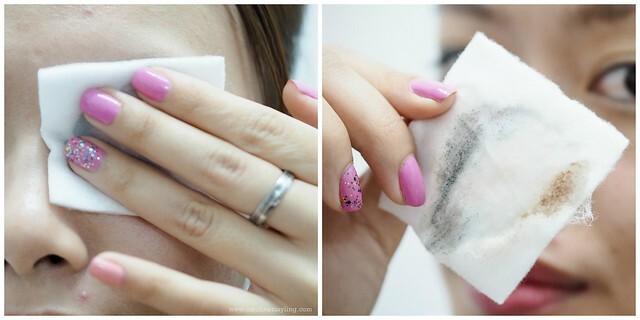 It picked up almost everything at one gentle wipe, hence I do not need any more than 3 cotton sheets to remove my both eyes and lip makeup. After I double cleansed my face, I will then apply this Brightening Enzymatic Refiner which acts as gentle exfoliant for my skin. I only use this product once per week. It is a leave-on exfoliant that helps to enhance the appearance of skin clarity, even tone and radiance. It has papaya enzyme (papain) as one of the main ingredients, this gentle enzyme efficiently lifts away lifeless skin cells without harsh beads and rubbing on your skin. It gives me a slight brightening effect after use it for 4 times in a month and also reducing the amount of blackheads and whiteheads around my nose and chin area. Before I proceed with my moisturizer, I will apply this Illuminating Essence on my skin. It claims that the skin regains its translucent appearance as the skin is brightened, hydrated and protected against damaging free radicals and oxidative stress. It visibly boosts skin luminosity with the LumiScience°® Technology through a 360° approach. I've been using this for a good month already and I noticed that it does help my skin to gain that luminosity as well as even my complexion. I really love to apply this before applying my foundation as it gives that glow and dewy effect onto my makeup too! In order to keep the translucency and radiant glow of my skin, I would use this Brightening Overnight Mask once a week into my skincare routine. This is an intensive overnight treatment mask that formulated with Silver Vine Extract and AlphaMelight™, which contains concentrated dose of brightening complex to help diminish skin discoloration, revitalize complexion as well as restore skin hydration while you rest. It helps to recharge tired skin with essential moisture and anti-oxidants to help skin regain it suppleness, vitality and youthful glow. My picture above taken with a very minimal amount of foundation applied on the skin. I basically applied a very thin layer of foundation on the center part of my nose and spread it thinly on the rest of face, because lately I really enjoy having skin-like foundation finish. When you already have a nice skin complexion, there's no need to apply entire foundation on your face. 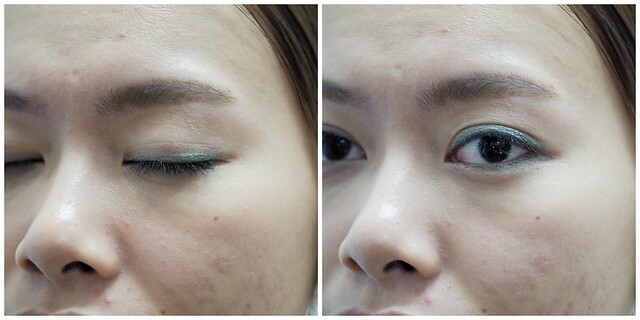 All you need is just a little bit to cover up some redness and certain blemishes! To sum it all up, Neesya skincare product has been treating my skin good and did not break my sensitive skin out too. Moreover, they are affordable too! 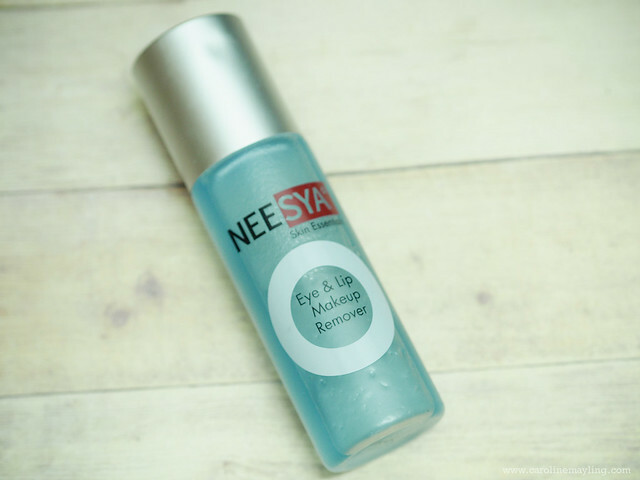 If you wanted to know more about Neesya skincare products, head to www.neesya.com to check out more of their product range! FIRST High Heel Dash in Malaysia! My Favorite innisfree Beauty Products!